Price includes (Actual coverage 2.280 mm) 2no 1050mm x 3m polycarbonate roof sheets 3no x 3m bars to fix to timber 2no x 3m edge fillets 2no x 1050mm sheet closures 1no x 150mm flash band Anti dust tapes Installation Guide Step one Fix y.. Select type of polycarbonate and colour required. Price includes (Actual coverage 3.260 mm) 3no 1050mm x 3m polycarbonate roof sheets 4no x 3m bars to go on timber 2no x 3m edge fillets 3no x 1050mm sheet closure 1no x 150mm flash band Anti dust tapes&nbs.. Select type of polycarbonate and colour required. Price includes(Actual coverage 4.310mm) 4no 1050mm x 3m polycarbonate roof sheets 5no x 3m bars to fix to timber 2no x 3m edge fillets 4no x 1050mm sheet closures 1no x 150mm flash band Anti dust tape.. Select type of polycarbonate and colour required.. Price includes (Actual coverage 5.370mm) 5no 1050mm x 3m polycarbonate roof sheets 6no 3m bars to fix to timber 2no x 3m edge fillets 5no x 1050mm sheet closures 1no x 150mm flash band Anti dust tape.. Select type of polycarbonate and colour required.. Price includes (Actual coverage 6.430 mm) 6no 1050mm x 3m polycarbonate 7no x 3m bars to fix to timber 2no x 3m edge fillets 6no x 1050mm sheet closures 1no x 150mm flash band Anti dust tapes .. Select type of polycarbonate and colour required.. Price includes (Actual coverage 7.490 mm) 7no 1050mm x 3m polycarbonate roof sheets 8no x 3m bars to fix to timber 2no edge fillets 7no x 1050mm sheet closures 1no x 150mm flash band Anti dust tapes In.. Select type of polycarbonate and colour required. 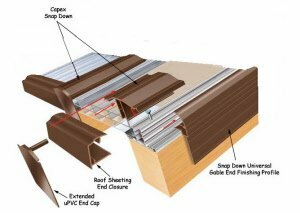 Price includes (Actual coverage 8.550 mm) 8no 1050mm x 3m polycarbonate roof sheets 2no edge fillets 9no x 3m bars to fix to timber 8no x 1050mm sheet closures 1no x 150mm flash band Anti dust tapes .. Select type of polycarbonate and colour required.. Price includes (Actual coverage 9.610 mm) 9no 1050mm x 3.0m polycarbonate roof sheets 10no x 3m bars to fix to timber 2no x 3m edge fillets 9no x 1050mm sheet closures 1no x 150mm flash band Anti dust tapes.. Select type of polycarbonate and colour required.. Price includes (Actual coverage 10.550 mm) 10no 1050mm x 3.0m polycarbonate roof sheets 11no x 3m bars to fix to timber 2no x 3m edge fillets 0no x 1050mm sheet closures 1no x 150mm flash band Anti dust tap.. Select type of polycarbonate and colour required.. Price includes (Actual coverage 11.550 mm) 11no 1050mm x 3.0m polycarbonate roof sheets 12no x 3m bars to fix to timber 2no x 3m edge fillets 12no x 1050mm sheet closures 2no x 150mm flash band Anti dust .. Select type of polycarbonate and colour required.. Price includes (Actual coverage 12.600 mm) 12no 1050mm x 3.0m polycarbonate roof sheets 13no x 3m bars to fix to timber 2no x 3m edge fillets 12no x 1050mm sheet closures 2no x 150mm flash band Anti dust ..